LAS VEGAS – Nevada Gov. 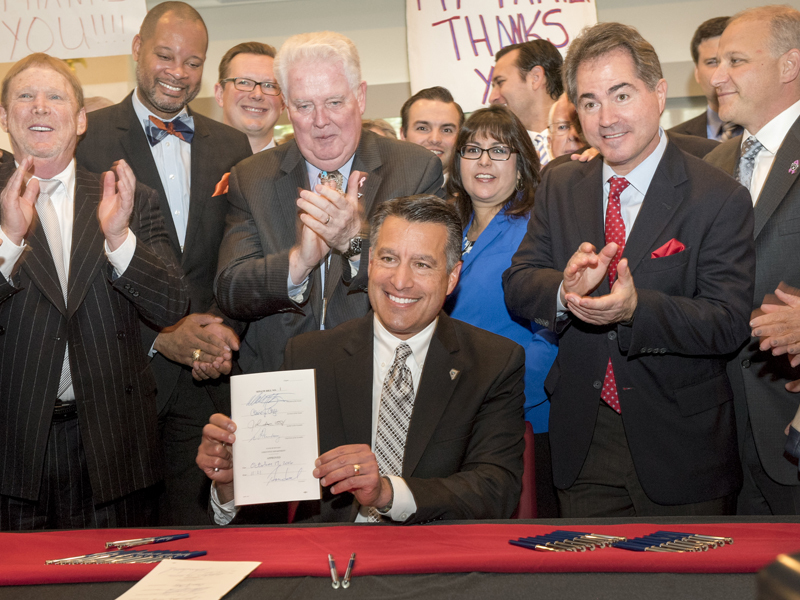 Brian Sandoval signed into law today Senate Bill 1 and Assembly Bill 1, the legislation passed to enhance Southern Nevada’s tourism infrastructure and public safety. The signing took place Oct. 17 at the Richard TAM Alumni Center at UNLV as result of last week's Special Session of the Nevada Legislature. The event included members of the Nevada Legislature, local elected officials, leaders from the gaming industry, business community and labor unions, representatives from the Raiders, UNLV students and administration, LVCVA President and CEO Rossi Ralenkotter, GOED Director Steve Hill, Sheriff Joe Lombardo, and Southern Nevada Tourism Infrastructure Committee appointees. Oct. 14 marked a historic moment in the history of Nevada as state legislators voted to move forward with two projects, the expansion and renovation of the Las Vegas Convention Center and the development of domed football stadium, that will propel Southern Nevada forward on the national stage, while creating jobs and boosting the economy. Nevada State lawmakers approved a bill during a special legislative session paving the way for development of the Las Vegas Convention Center District, a $1.4 billion project that will add 600,000 square feet of new meeting space and secure Las Vegas’ position as the world’s premier business destination. The bill also included provisions for the development of a $1.9 billion, 65,000-seat stadium that could house the University of Nevada, Las Vegas football team as well as a potential professional football franchise and a variety of special events. The legislation calls for a 0.5 percentage point increase in Clark County’s room tax to help fund the Las Vegas Convention Center District as well as an additional .88 percentage point room tax increase to support development of the stadium. Combined, the convention center expansion and stadium projects are expected to create more than 14,000 jobs and pump one point four billion dollars into the economy. The two projects will have an annual incremental economic impact of $1.43 billion and will attract one million additional visitors each year. The projects were vetted by the Southern Nevada Tourism Infrastructure committee before the special legislative session was called to order. The group was created by Governor Sandoval to review several projects critical to the future of Southern Nevada. After conducting more than a dozen meetings over the course of 14 months, the committee recommended the convention center expansion, stadium and police proposals move forward for consideration by the Nevada state legislature to determine funding and next steps. The Las Vegas Convention Center District expansion will allow the Las Vegas Convention and Visitors Authority to pursue new business opportunities while also growing the shows currently taking place in the destination. Las Vegas hosted nearly 22,000 meetings, conventions and trade shows in 2015. Trade Show News Network recently recognized Las Vegas as the No. 1 trade show destination in the country for the 22nd consecutive year for hosting 54 of the top 250 largest trade shows in North America. The Las Vegas Convention Center (LVCC) hosts 22 percent of all convention attendees traveling to Southern Nevada. The facility directly supports 9,400 local jobs and $379 million in local wages and salaries. The LVCC hosted 49 events in 2015 with a combined attendance of 1.3 million people. These visitors generated $2.1 billion in total economic output in 2015. In addition to the Las Vegas Convention Center District and stadium proposals, Nevada’s legislators also voted in support of a separate bill that would allow the Clark County Commission to raise its sales tax to add additional police resources to the destination.